A prior post reviewed the U.S. presidential election of 1900, in which Republicans William McKinley and Theodore Roosevelt were the winning candidates for President and Vice President. Now we focus on Roosevelt’s involvement in that election. The involvement began at the Republican Party’s national convention in Philadelphia in June. 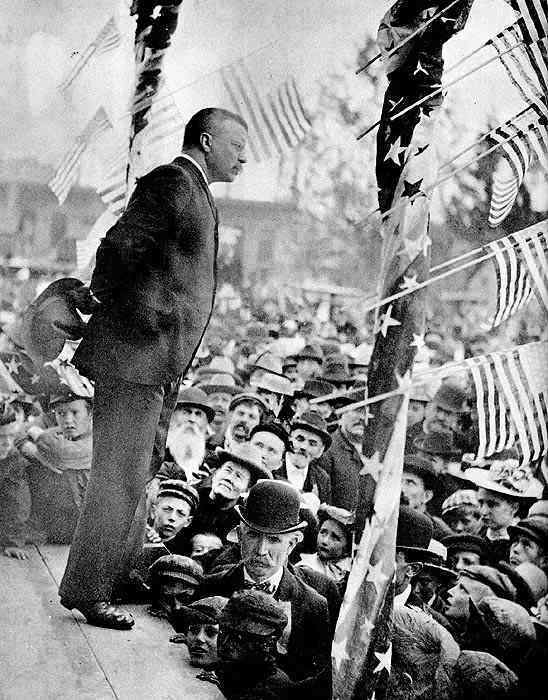 Although Roosevelt repeatedly had opposed suggestions that he be the Party’s vice presidential nominee, he did attend the convention as a New York delegate-at-large. Once there, he made dramatic arrivals in the city and on the convention floor. Roosevelt confirmed his acceptance of the nomination in a lengthy letter of September 15th (two and a half months after the convention) that repeated some of the points of his seconding speech at the convention and that attacked the issues promoted by William Jennings Bryan. The Almanac of Theodore Roosevelt’s compilation of his “Complete Speeches,” however, only has six campaign speeches, three of which are rebuttals of William Jennings Bryan. The other three bear comment. 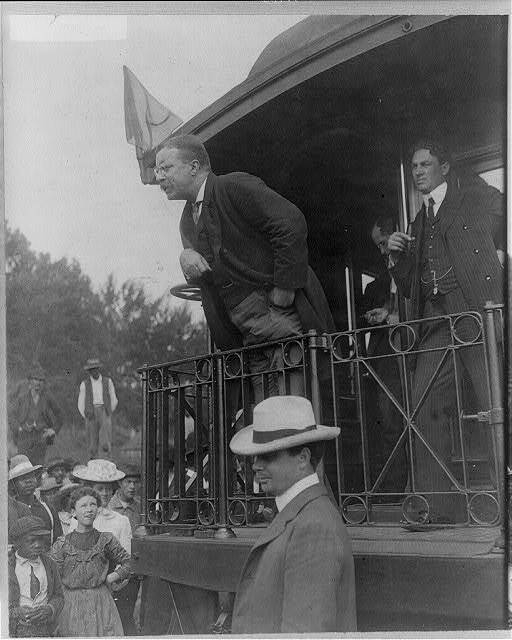 Roosevelt on his campaign train from Quincy, Illinois to Chicago in September was accompanied by three railroad executives: my maternal great-great-uncle, William Carlos Brown, then General Manager of the Chicago Burlington & Quincy Railroad; Theodore P. Shonts, then the President of the Illinois & Iowa Railroad (“I&I RR”); and Paul Morton, then the President of the Santa Fe Railroad (“the Santa Fe”). The general theme of the speech was the importance of “the spirit of brotherhood in American citizenship” that is fostered by association with others not in our “own little set.” Roosevelt emphasized this from his own life in working with “mighty men of their hands” in the Northwest cattle country, with farmers and with “skilled mechanics of a high order.” He added that he had been “thrown into intimate contact with railroad men [and] . . . gradually came to the conclusion that [they] . . . were about the finest citizens there were anywhere around.” Presumably the three railroad executives with him on that trip were included in that group. Roosevelt’s last major speech before the November 6th election was on October 26th at New York City’s old Madison Square Garden. Edmund Morris, The Rise of Theodore Roosevelt at 767-68 (Random House; New York; 1979). Id. at 768. In 1912 after the Republican Party re-nominated William Howard Taft as its presidential candidate, over Roosevelt’s opposition, Roosevelt organized the Progressive Party (nicknamed the Bull Moose Party) and ran as its presidential candidate. With these two parties splitting the conservative vote, the Democratic presidential candidate, Woodrow Wilson, won the election. The rebuttals of Bryan were in Detroit on September 7th and Evansville, Indiana on October 12th and in a published letter of October 15th. Shonts grew up in Centerville, Iowa, and after graduating from Illinois’ Monmouth College, worked in Iowa as a bookkeeper, then an attorney and as an executive of a construction company that built stretches of railroad track. This lead to his becoming an executive for the I&IRR. 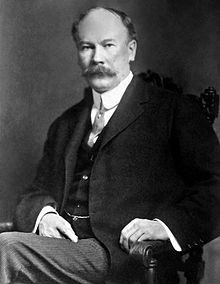 In 1905 then President Roosevelt appointed Shonts to be the Chairman of the Isthmian [Panama] Canal Commission, a position he held until March 1907, when he became President of the Interborough Rapid Transit Company, which operated New York City’s rapid transit system. Morton was born in Michigan and grew up in Nebraska as the son of a former U.S. Secretary of Agriculture; his older brother was the founder of Morton Salt. 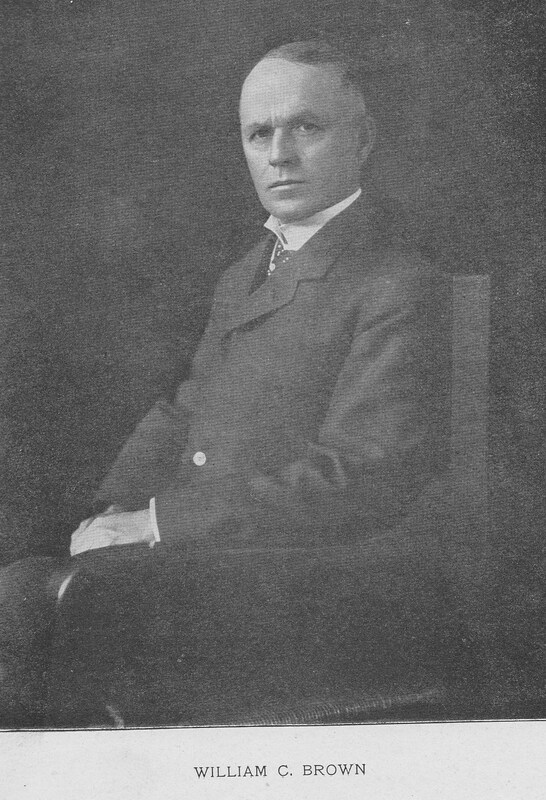 In 1904 President Roosevelt appointed Morton as Secretary of the Navy, but in 1905 he was forced to resign after evidence surfaced that the Santa Fe under his presidency had granted illegal rebates. 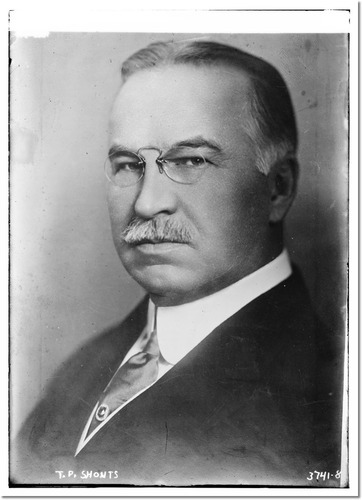 Morton, however, then became the President of the Equitable Life Assurance Society in New York City. This account of the Quincy-Chicago trip is based on a January 30, 1907, letter from Brown to Schonts saying “I often think of the trip from Quincy to Chicago, when . . . you and Paul [Morton] and I had the pleasure and the honor of a ride across Illinois with Theodore Roosevelt, then a candidate for Vice-President.” (Image (# 71-0572) provided courtesy of the Library of Congress Prints and Photographs Divisions and Theodore Roosevelt Center at Dickinson State University, www.theodorerooseveltcenter.org.) I plead for anyone who has more information about the Quincy-Chicago trip or the discussions the three railroad executives had with Roosevelt to share such information in a comment to this post. Gov. Roosevelt Speaks, N.Y. Times (Oct. 27, 1900).